*black circles on the Pokemon mean I have it, the one's untouched are the remaining one's I need. This update only contains my nidorinos; most of my collection is packed away still [I just had to get these rhinobunnies out <3] and I don't have room to get out my space wangs Palkias and pitcher plants Victreebels. I've been part of the comm since early '09.. but I've been hiding! Hi to everyone who's new! let's cut to the chase -- i have some REAL, HAND DRAWN BY THE ANIMATORS! Pokemon Anime genga for sale! -MOVIE 14 THE WHITE HERO RESHIRAM! all of my sales rules and feedback can be seen here! if you have interest in owning one of a kind, literally, these are hand-drawn and not photocopies, they are literally one of a kind items, check below the cut! I'll delete the post once I get a couple of answers. If something like this isn't allowed let me know and I'll delete the post. Hi all, just wondering if anyone would be interested GAing this lot with me? 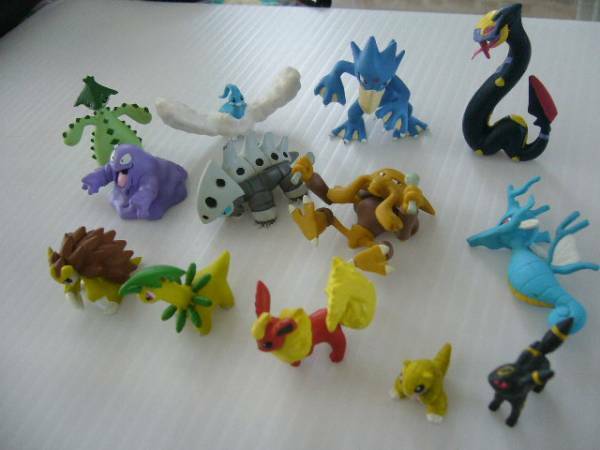 Has a few rare pieces like Kingdra, Altaria, Grimer, Alakazam, Flareon, Umbreon, Seviper, Golduck, Aggron, etc. Thanks guys, and sorry for the boring post! I'll keep an eye out for some larger lots too. I think the picture encapsulates all my joy on this pair of cuties. And I don't know how, but it was won for only 2000 yen before fees etc, which was even cheaper than my single plusle canvas alone, I don't know how that happened really. But anyways, since I have a spare plusle, I will be auctioning off the one on the left at a later date, so stay tuned for that. On another note, just an update about me. My name is Brandon and I live in Singapore. Yes I am a guy, that's part of the 15% of the comm XD. Lastly, all items bought within the last week has been shipped out :) Thank you very much for reading! I was just wondering, what is the official name for it? I think it may be one of those racer things from 7-11 but i'm not sure. It was made in 2011 according to the bottom. What brand is it also? I'll probably delete this post after I find out. YAYYEH FINALLY A COLLECTION UPDATE!! Contest Entry and Some New Gets! Please read this post if you have claims or on the waitlist in the final wave! The final wave is coming up on us in about a month, February 25th! This wave is going to be possibly the biggest one; Unova are by far the most popular guys! We felt it was necessary to double check some things just in case of mistakes, and to clear any misunderstandings. -Please double check your claims to make sure they are correct and that you are everywhere you're supposed to be!!! -It is high probability Gin will go 3 for 3 and pick everything up on the waitlist along with the claims! Please check the (now public) waitlist to make sure you are down for Pokemon you are indeed still interested in! Leave a comment RIGHT AWAY on this post if you feel there has been an error somewhere!!! Please link to your original comment on the claims post! 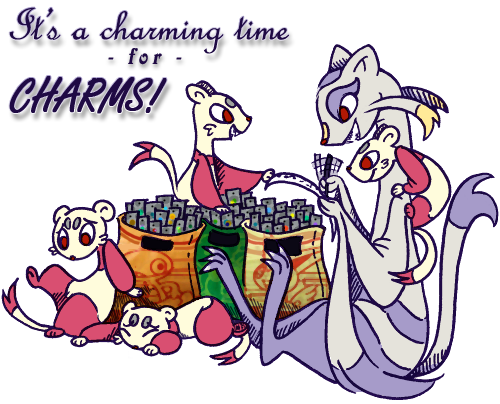 -Gastrodon, Giratina, Shaymin, Deerling, and other Pokemon with various formes of some kind are most likely getting charms of each forme at this point! Since it was so unknown at the beginning, it's likely that some claimers weren't expecting to have to pay $25 for a Deerling set. Leave a comment RIGHT AWAY on this post if you wish to drop your claims for any of these! -Combining with Sunyshore orders: please refer to Gin's post on the subject of combining with upcoming February goods!! -The claims post will be closing (for good!) FEBRUARY 10TH. You have from now until then to claim more charms if you choose to do so! Commenting to confirm you're still interested in your claims and waitlisted charms is not the purpose of this post, so rest easy there! BUT FIRST READ MY RULES!!!! 3) if you are asking for a quote, PLEASE MAKE SURE YOU WORD IT CORRECTLY. eg: if you say "dat squirtle to 90210" that means you are buying the item, not asking, and if you back out you will get NEGATIVE FEEDBACK. time and time again people have not paid attention before jumping the gun! He is quite big as u will see a pic with him and my other mewtwo plushies. Aloso, I'm looking for buying this charm set, if someone do pick up. Ok so...I saw this charm a few days ago and practically died inside. So I officially need this charm!! It was available in 2009. :) Johto Dex charms!! It was recently quoted around $10-$15 from another comm member in the last few days so I would like to pay $15 shipped. If you do have this charm let me know!! I also have TCG I can trade if you are interested in those. :) Thank you!! In case you haven't heard already, we not only WON this auction, but we got some incredible discounts!! There will be three payments: Item total+Noppin fees+paypal fees, shipping from Noppin to poliwhirlshipping from poliwhirl to you. She will be shipping from Hong Kong. Once paid, please let us know in a comment! I joined the community not just to help my collection grow but to also meet wonderful people such as yourselves you share the same interest as me. I'm new at "officially" collecting so my main target pokemon havn't got much in them yet. Time for a (superrrr belateddd) collection update! Hi all c: a few of you may remember me, but I thought I'd re-introduce myself and my collection! My name is Nick, but my online alias is TerryRose. I'm 20 and from the UK~! Rather than collect just one Pokemon, I have a great love for all pink Pokemon! 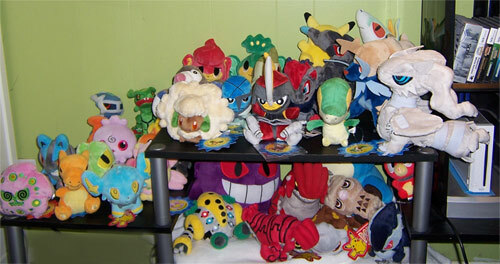 My biggest collection is Audino, even though my favorite is Flaaffy. I also have a lot of side collections! Last time I did a collection update was Feb 2011! Here's my collection then.. Title says it all~ I've looked all over the interbutts for the canvas Growlithe and come to the conclusion that $70 (shipping not included ><) is too much, even for an adorable Growlithe. I'm not sure if they're out of production or very hard to find or something and that is legitimately the price that they should be going for right now, but it can't hurt to ask. BTW can somebody plz tell me how did the community reacted to the stop SOPA/PIPA/ACTA wednesday last week plz?